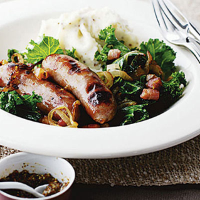 Easy and quick, pan-fried kale with bacon makes a tasty accompaniment to plump pork sausages. Preheat the grill to medium and cook the sausages for 10-12 minutes, turning occasionally, until browned and thoroughly cooked. Meanwhile, heat the oil in a large frying pan or wok and add the onion and garlic. Fry for 2-3 minutes, stirring constantly, until the onions are slightly softened. Add the lardons and cook for 3-4 minutes, until golden. Stir in the kale and fry for a further 3-4 minutes, until it is just wilted and piping hot. Season with black pepper and serve immediately with the sausages. Mustard-flavoured mashed potato also makes a lovely accompaniment (see cook's tip). Stir 1-2 teaspoons wholegrain mustard into a heated 450g pack ready-prepared Waitrose Mashed Potato just before serving. The sausages can be baked in the oven at 200°C, gas mark 6, for about 20 minutes if preferred. Hearty, medium-bodied red wines are a great match for sausages and bacon.